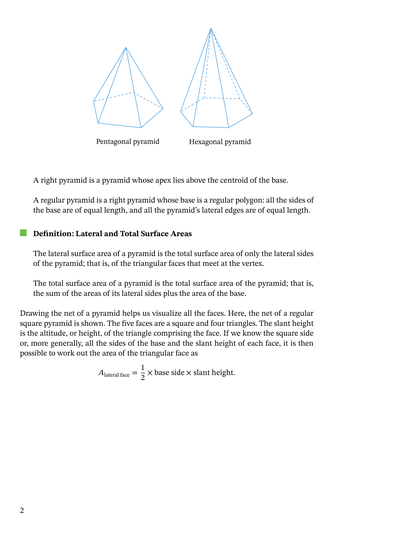 In this lesson, we will learn how to calculate a regular pyramid’s lateral area given the slant height and the perimeter of its base and to find its total surface area. 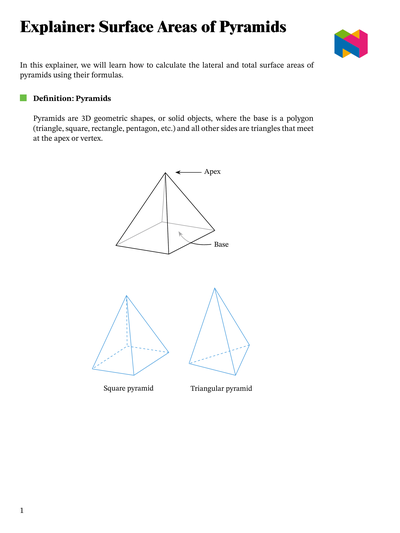 If the given figure was folded into a square pyramid, determine its lateral surface area. Determine the surface area of the given square pyramid, given that all of its triangular faces are congruent. 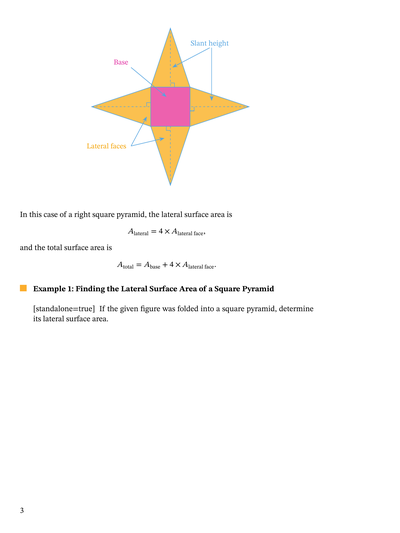 Determine the surface area of a pyramid with slant height 15 and a square base of side 10. A square pyramid has a lateral surface area of 390 cm2 and a slant height of 13 cm. Determine the length of each side of its base. Find the total surface area of the given net, to the nearest hundredth. 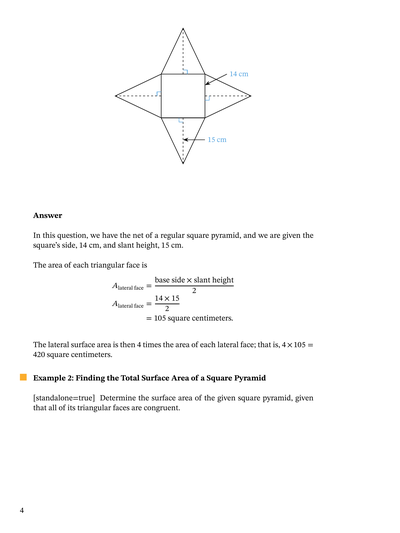 Determine the surface area of the given regular pyramid. Find the total surface area of the given regular pyramid, and approximate the result to the nearest hundredth. In a square pyramid with base side 30 cm, the distance between the apex and any base vertex is 56 cm. Determine, to the nearest integer, the surface area of the pyramid. Find the surface area of the given square pyramid. Determine the total area of the following net approximated to the nearest hundredth. Find the total surface area of the regular pyramid in the given figure, approximating the result to the nearest hundredth. Find the surface area of the given pyramid to the nearest tenth. Determine the surface area of the given regular triangular pyramid. A square pyramid of base side length 88 cm has lateral edge 92 cm. What is the total surface area of the pyramid, to the nearest whole number? Find the lateral area of a regular hexagonal pyramid with a base edge of 9 centimetres and a lateral height of 19 centimetres. A square pyramid has a lateral surface area of 42 yd2. If its slant height is 3 yd, determine its total surface area. Find the lateral and total surface areas of the regular hexagonal pyramid with slant height 48 cm and base side 20.3 cm. Give your answer to the nearest tenth. If the edge length of a regular triangular pyramid is 136 cm, find the surface area of the pyramid approximated to the nearest integer number. What is the surface area in square centimetres of a regular triangular pyramid given that the sum of its edge lengths is 42. The pyramid of Khafre in Egypt stands 471 feet tall. The sides of its square base are 705 feet long. Find the lateral surface area of the pyramid of Khafre. The surface area of a square pyramid is 104, and its base area is 16. Determine the slant height of that pyramid. Determine the height of a square pyramid having a surface area of 700 cm2 and a lateral surface area of 504 cm2. A square pyramid has slant height 49 cm and lateral surface area 490 cm2. What is the perimeter of its base? If the slant height of a regular triangular pyramid is 9 1 √ 3 cm, find the sum of areas of its faces rounded to the nearest whole number. A regular hexagonal pyramid has a height of 5 cm and a base perimeter of 6 6 √ 3 cm. Determine its total surface area to the nearest hundredth.